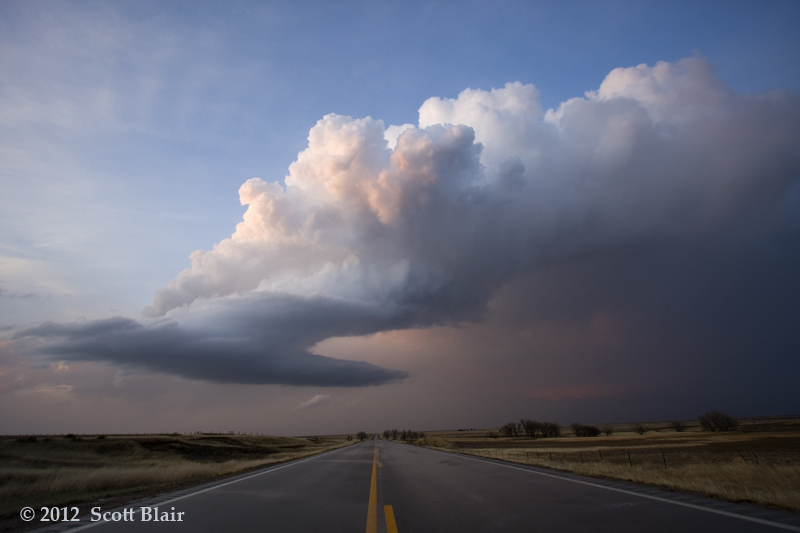 Two awesome supercells moved across SW Nebraska during the evening hours. Both storms nearly took identical tracks with seemingly no effects from preexisting cold pools. We sampled hail in the vault in both storms with 2.50-3.00 inch stones observed. The final storm (night) had several well-formed inflow tails with an active lightning show. 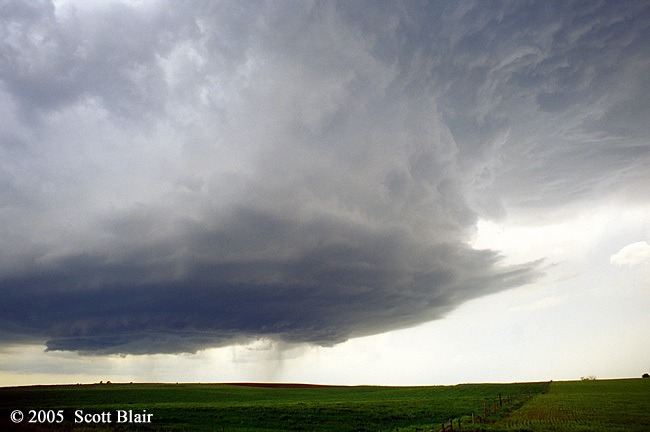 This supercell was in the process of transitioning from a classic to a HP supercell. The storm is producing a dust whirl tornado and a few power flashes were observed. 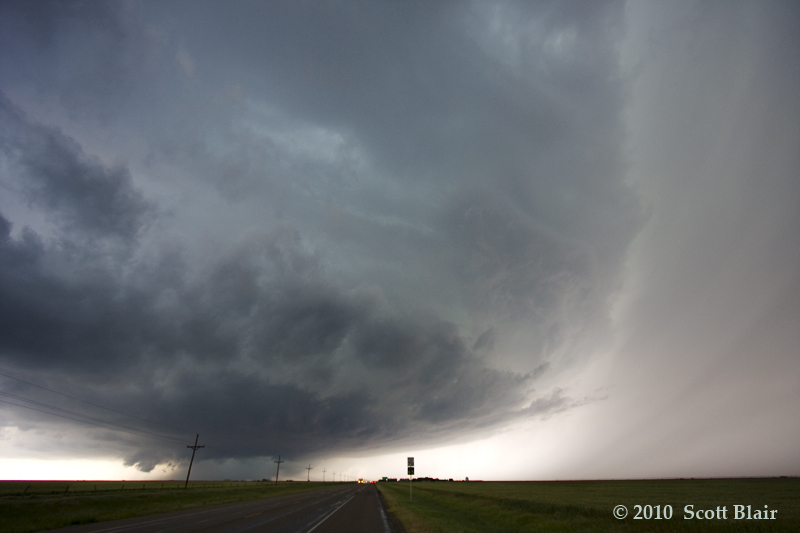 However, the storm structure was much more impressive with a highly striated vault region and long inflow tail. I had stayed underneath or right next to this beast for the majority of the daylight hours during hail operations, but jumped ahead of it south of Seymour as safety concerns increased. 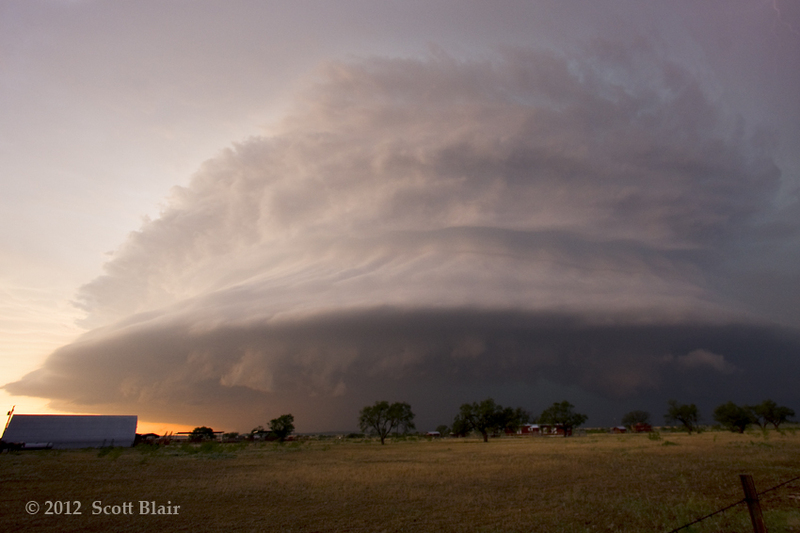 The supercell was spectacular at sunset, with a multi-layered structure that gradually elongated with time. To no surprise, it was an efficient lightning producer as it gradually became ingested in a developing MCS. 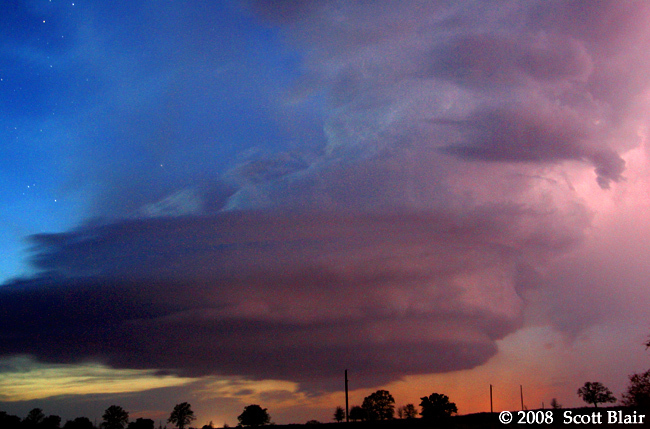 This was perhaps the most photogenic, long-lived supercell I observed in 2009. I was fortunate to find a rain-free overlook at sunset south of Prowers to enjoy this amazing storm structure with rich color. This early season chase was a fun start to the 2012 season. 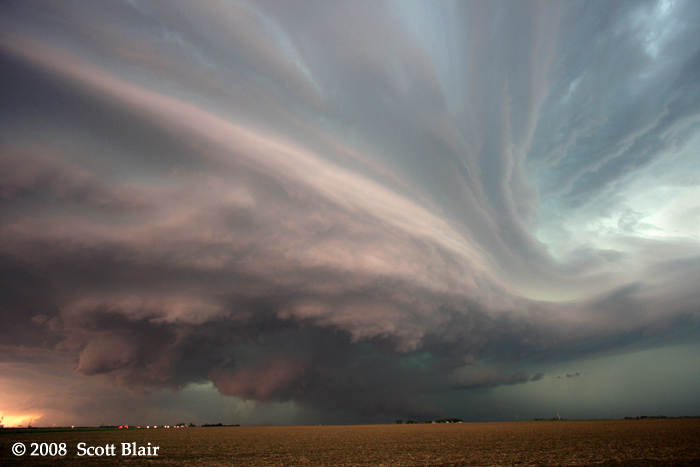 It was also a special day shared with my Dad during his first Great Plains supercell. 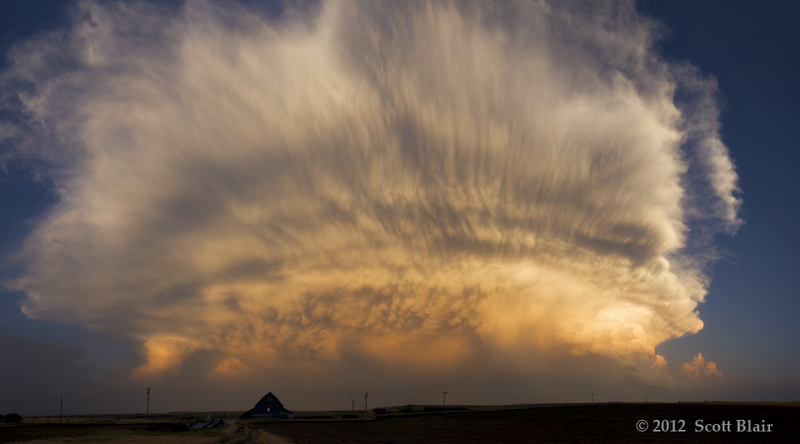 A skeleton LP supercell developed across western Kansas and moved north, turning colors and decaying at sunset. 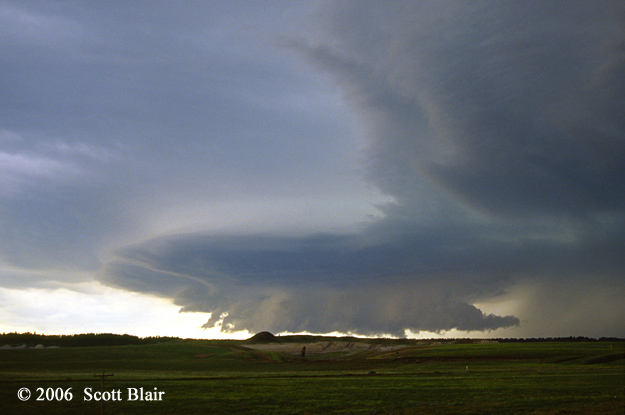 After producing a long-lived, violent tornado near Bowdle, the storm moved east and produced a few more. 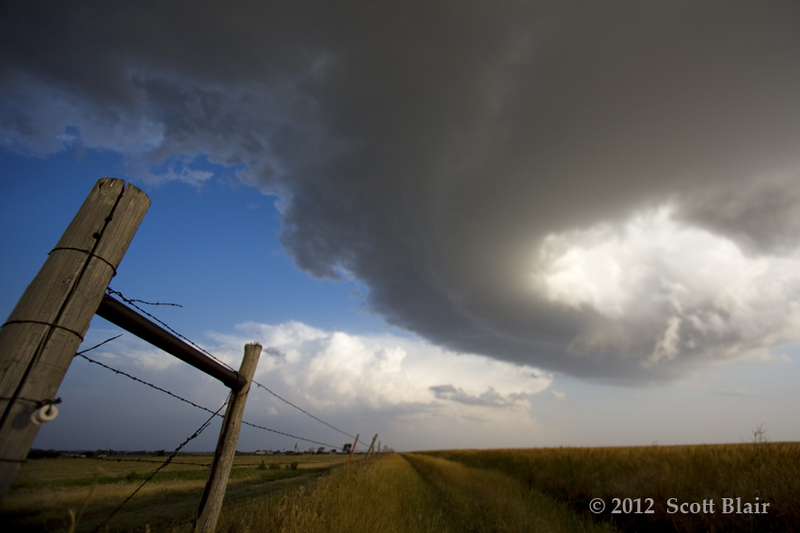 We flanked the storm and were treated to some beautiful structure. Inflow winds were so strong, spray from the lake near the road soaked us. 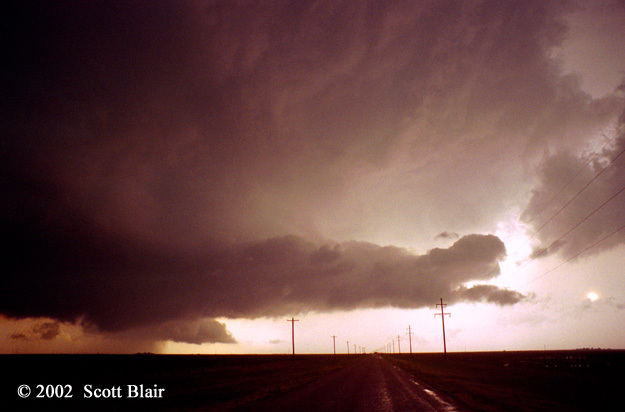 A long-lived supercell slowly moved across the Texas Panhandle along Highway 152 for several hours. 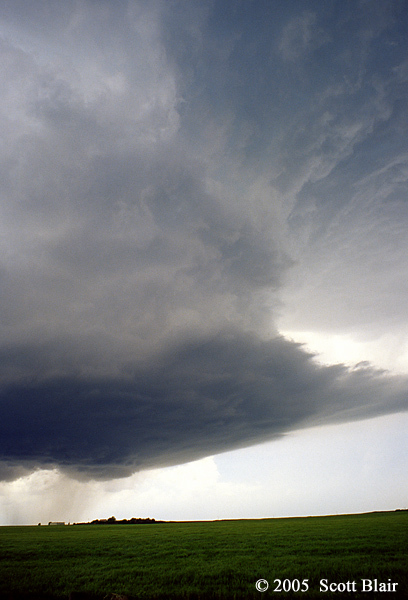 It produced several weak tornadoes along its journey. The storm structure consistently improved throughout its life, with the highlight view near Stinnett where the easterly road options ended. 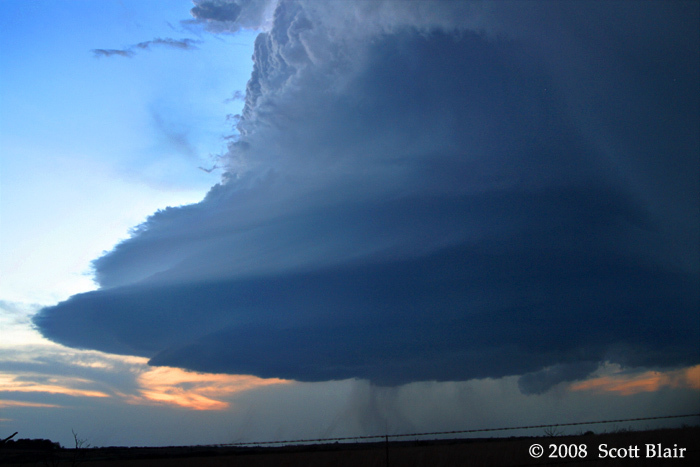 A classic supercell evolved across portions of western Kansas during the afternoon of 22 May 2007. 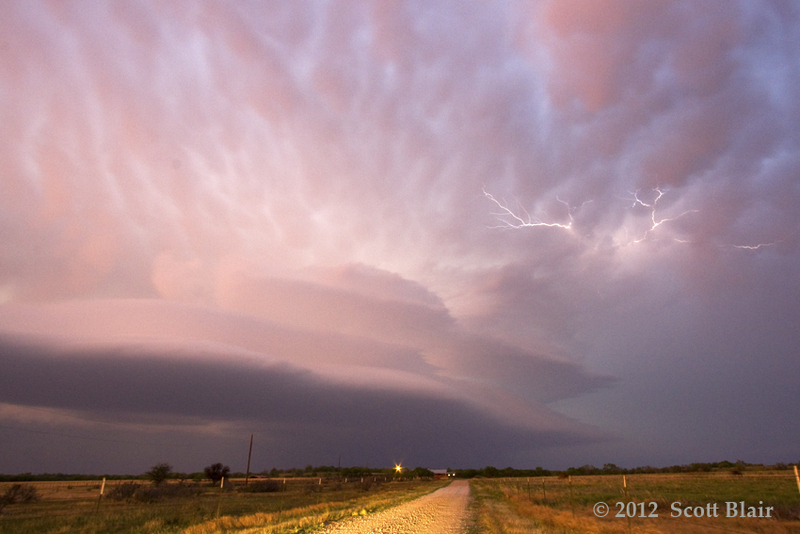 This was a very memorable day thanks to the breathtaking storm structure. Storm motion was fairly slow and road options were plentiful. 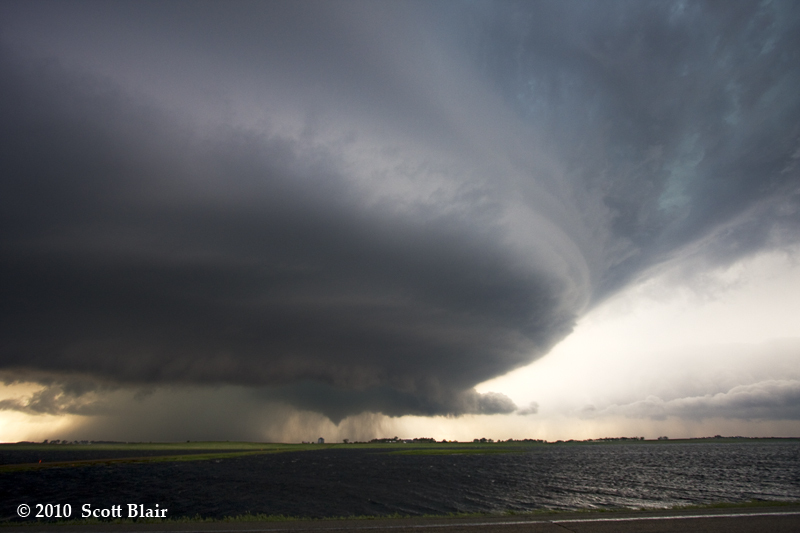 The climax of the chase was a 10 minute tornado combined with the awesome structure. Several supercells were observed earlier in the day, but none compared to the excellent structure observed at twilight near Windthorst. We hopped east every several minutes to take stills and follow this striated beauty. I dove south towards Shannon to watch the storm begin to dissipate in a magnificent fashion. 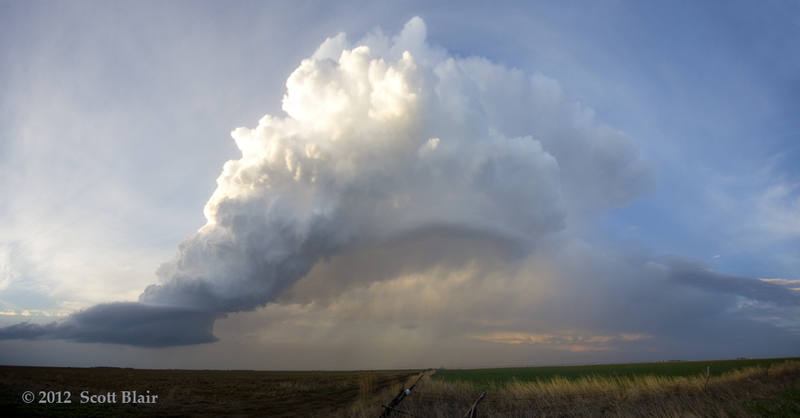 Several marginal supercells were observed during the late afternoon and evening hours around Hays, KS, each progressively becoming more photogenic. After one produced an interesting low-level occlusion, we turned our attention to sunset and one final storm. 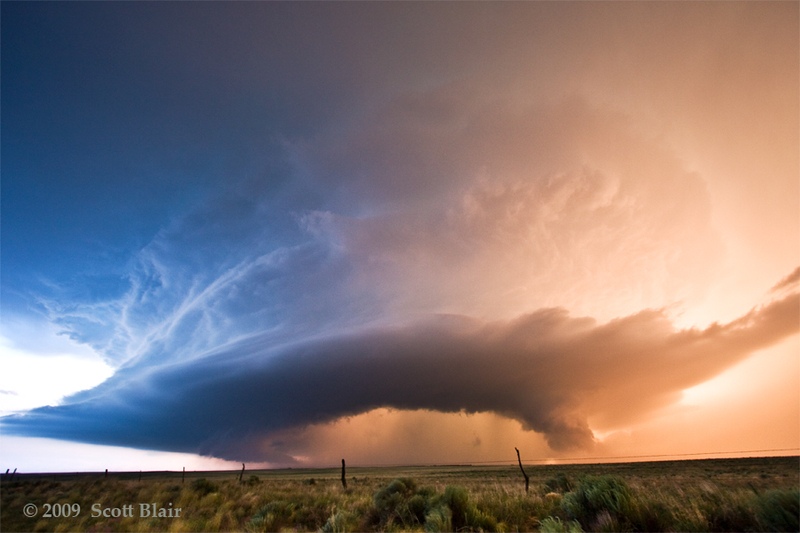 A gorgeous storm structure sunset was observed on a dirt road, free of any human-originated sounds. 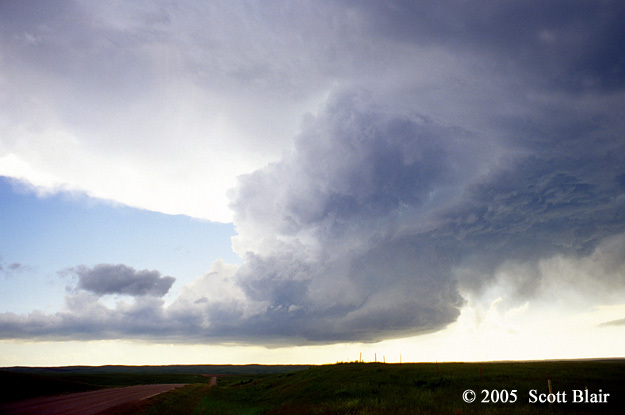 A low-precipitation supercell developed near Interstate 90 north of the Badlands National Park near Wicksville, SD during the afternoon of 21 May 2004. 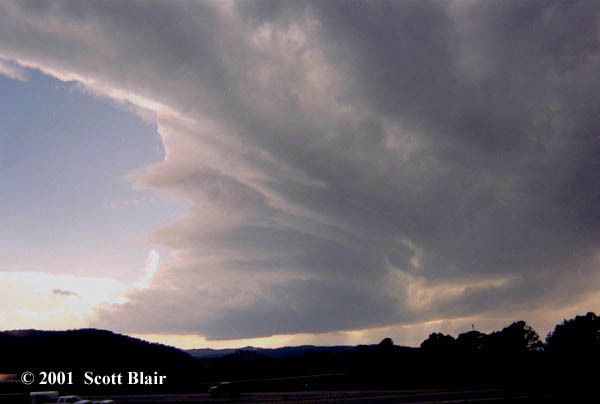 The mid-level updraft featured a corkscrew appearance along with a long beaver tail stretching into the base of the storm. 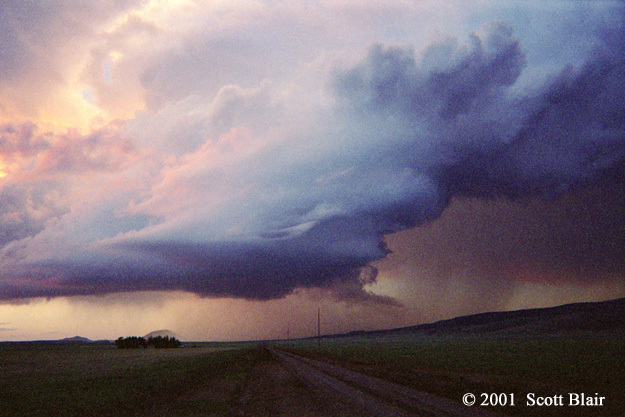 An impressive supercell materialized in a fairly rural region of southeast Montana during the late-afternoon of 8 June 2006. 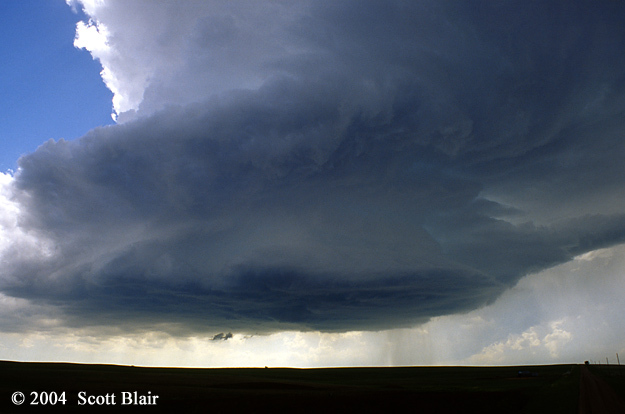 The storm was characterized by a well-separated precipitation core and a circular updraft base. A large blocky wall cloud became attached and we were hopeful it would constrict in size. As the storm passed by, we observed near tennis ball size hail resulting in many new dents. 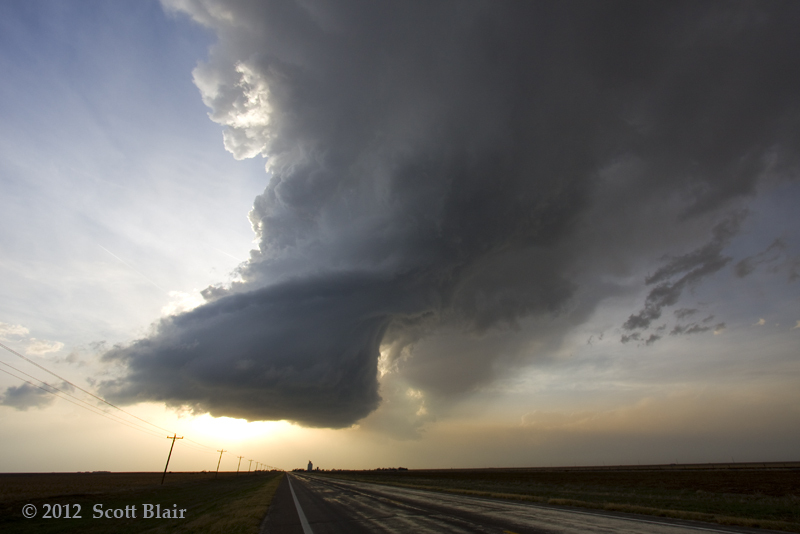 We observed a stunning supercell just before dark along Hwy4 in central Kansas. It was a challenge to make ground and get far enough ahead of the storm, but we had just enough light to marvel at the structure. Missed the infamous Wyoming tornado by under one hour after a long drive from Kansas City, but was still rewarded with breathtaking structure in western Nebraska. The highlight of the day was near Broadwater with a fantastic overlook of the river valley combined with wild vault lightning and excellent structure. 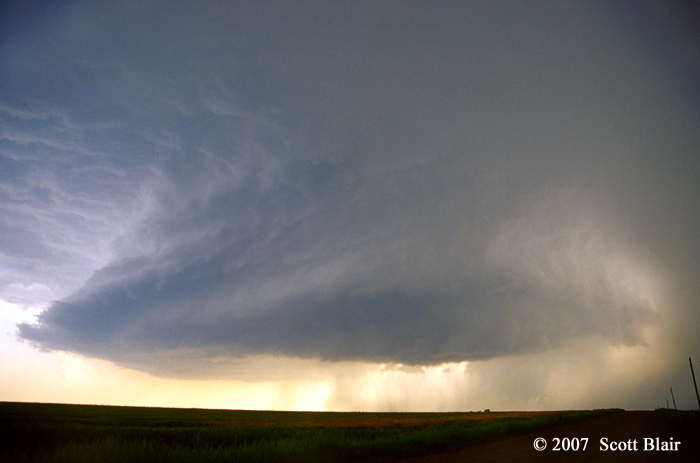 One of the most spectacular LP supercells I’ve observed to date on 3 June 2003. 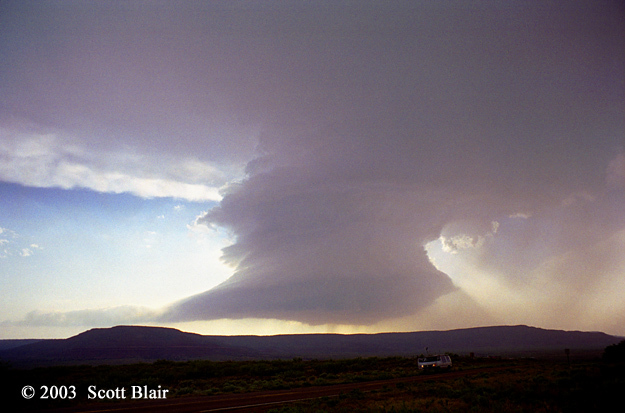 This storm took several hours to evolve, but matured in splendid fashion near the higher terrain at Mosquero, NM. 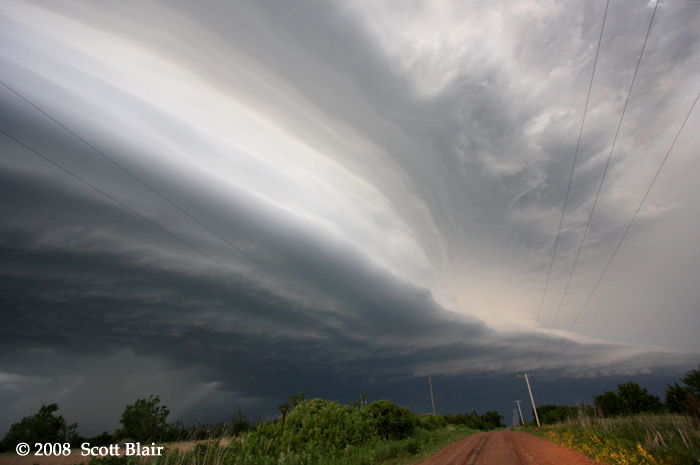 The long-lived storm featured impressive striations and a well-formed vault region for most of its existence. 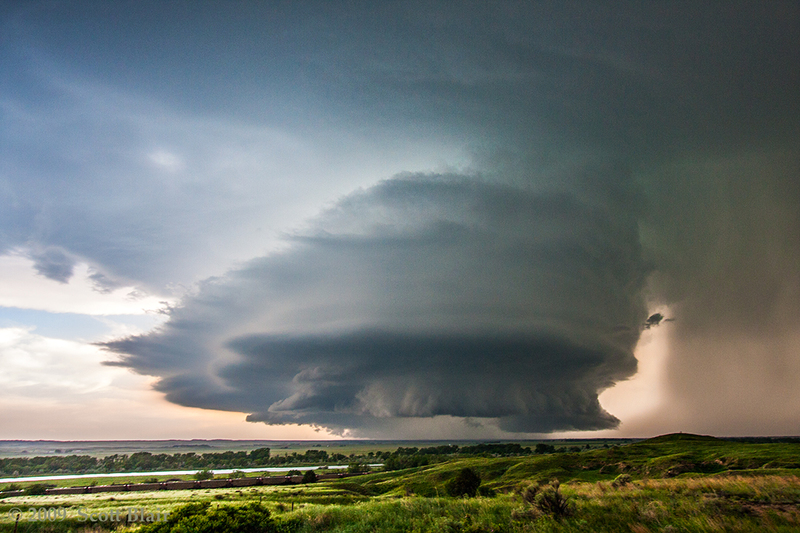 A spectacular long-lived supercell developed across south-central South Dakota near Wanblee, southeast of the Badlands National Park. The storm was initially LP in nature and produced one long rope tornado shortly after the first photograph. 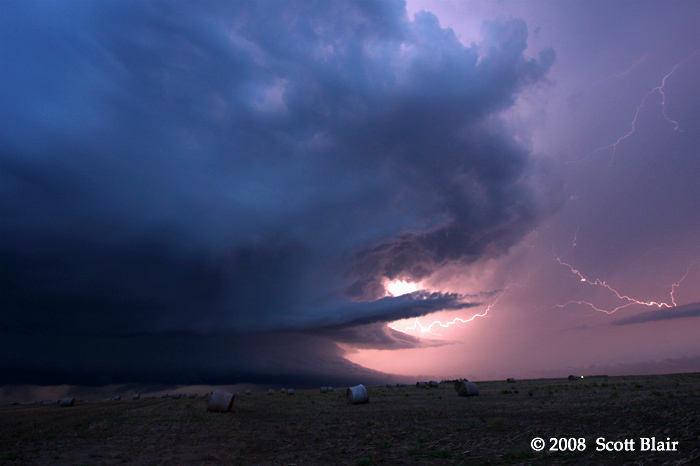 With time, the storm became classic in structure as depicted with the final two images. 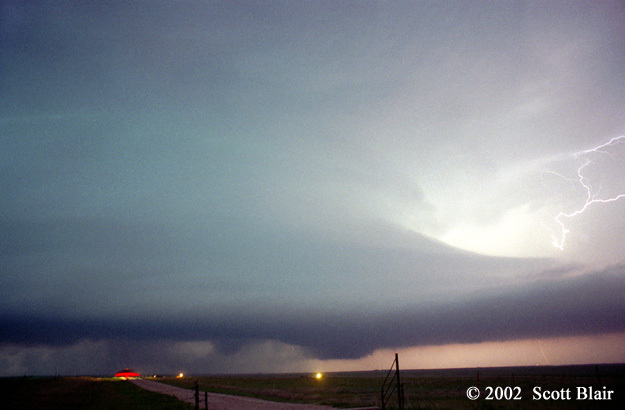 Several tornadic supercells developed across the Texas Panhandle on 23 May 2002. 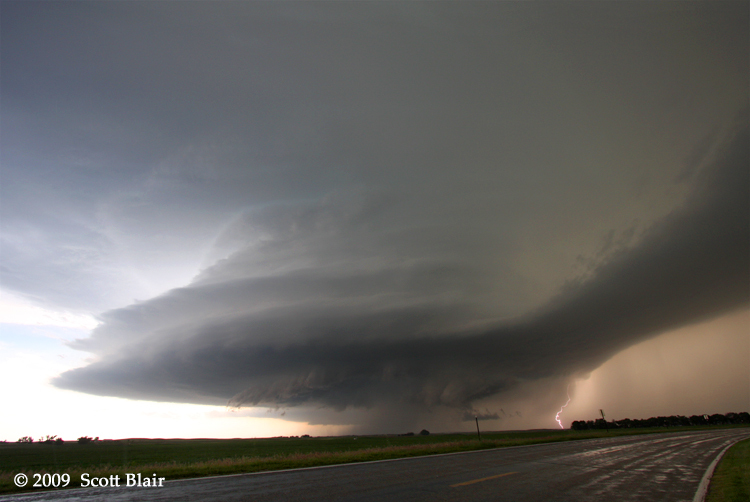 In the first image, a wall cloud and hook-echo precipitation is evident underneath amazing structure featuring a large vault region and inflow tail. We witnessed a brief tornado near Spearman, TX associated with this storm. Dropping south afterwards, another incredible supercell was observed near Pampa, TX complete with continuous lightning and jaw-dropping structure. 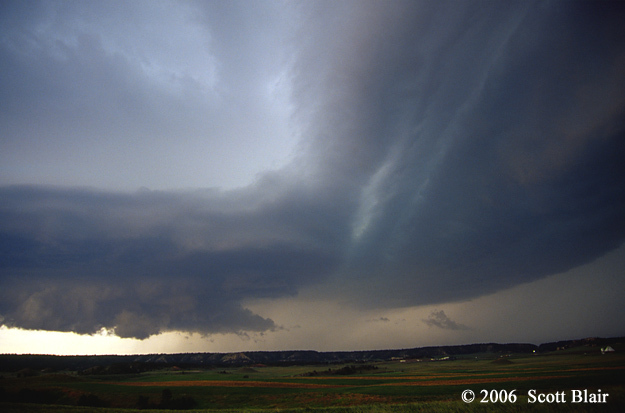 This is a view of the supercell shortly before it produced the infamous Mulvane, KS tornado on 12 June 2004. Impressive rotational banding is evident along with a tight lowering towards the right of the image. Significant cloud-based rotation was ongoing at the time of the photo. Chase partner Eric Nguyen’s instrumentation is in the foreground. 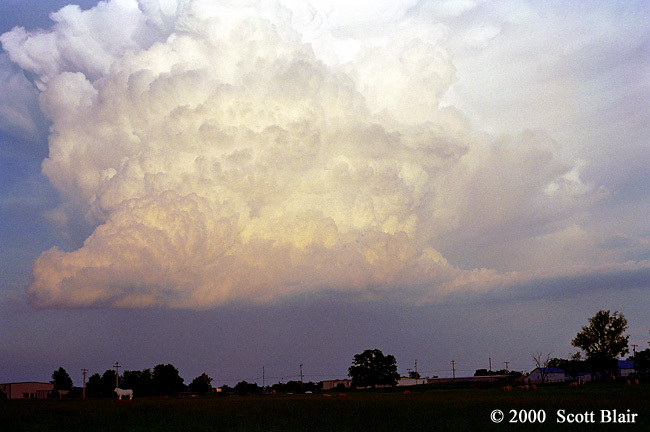 A high-based LP supercell formed in western Arkansas, east of Fort Smith during the early evening hours of 22 May 2000. Even with its significant severe weather probability handicapped, it made for a beautiful storm. The convection on the backside was rock-hard for several hours and an inflow tail stretched across the horizon. 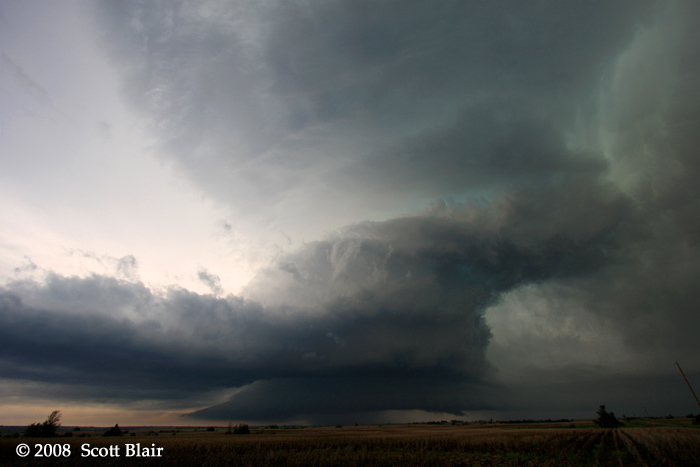 This storm was so large; the photo only includes half of the updraft region. This storm had earlier threatened to produce a tornado, but slowly became outflow dominant, albeit beautiful structure, near the time the photo was taken. 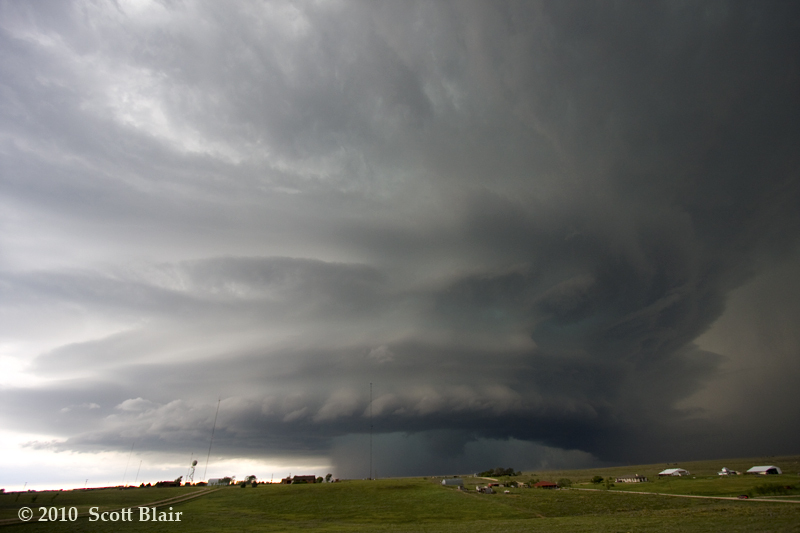 An impressive rotating LP supercell formed along the Front Range near Trinidad, CO. 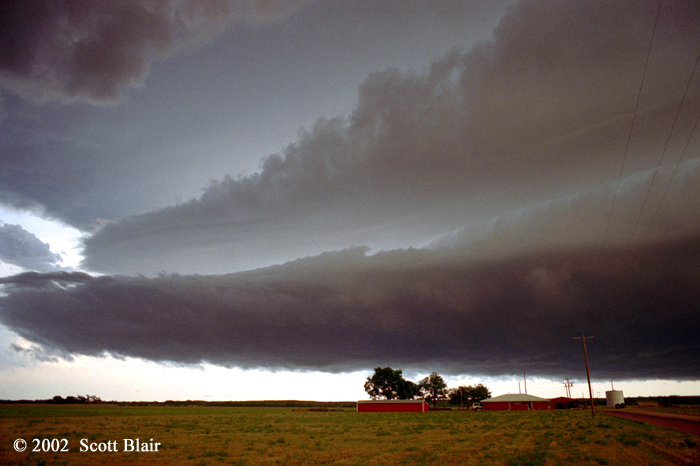 This was one of four supercells observed on 28 May 2001, with this storm the only LP in nature. 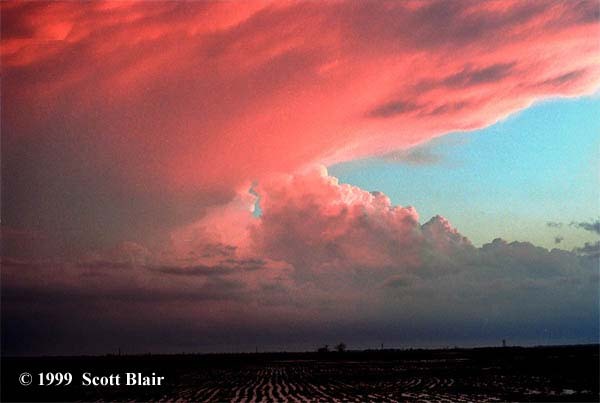 Sunset provided a vivid red hue to this tornadic supercell in northeast Arkansas on 17 January 1999. This was certainly a rare situation with a high-caliber storm early in the year and the lack of low clouds that traditionally obscure storm features in the state. 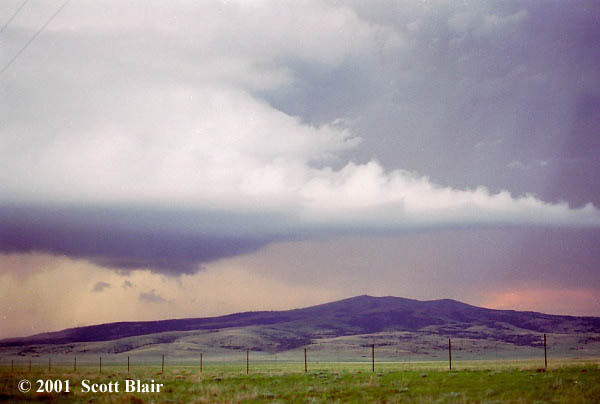 This LP supercell slowly moved eastward at 5 mph in a remote region of northeast New Mexico. It was a surreal moment with no audible signs of human activity, a laminar-looking LP, and stunning scenery. © 1996-2014. All pictures and images are copyrighted by Scott F. Blair. Any reproduction either electronic or otherwise is strickly prohibited by Federal Law.